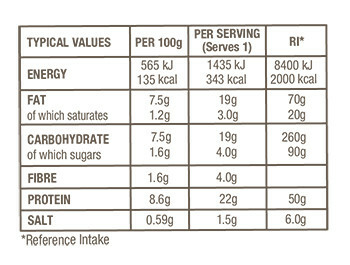 ORGANIC TOFU (WATER, ORGANIC SOYBEANS, MAGNESIUM CHLORIDE - FIRMING AGENT) (29%), ORGANIC HASH BROWNS (ORGANIC POTATOES, ORGANIC ONIONS, ORGANIC OLIVE OIL, ORGANIC GARLIC, SEA SALT, ORGANIC BLACK PEPPER) (21%), ORGANIC TOMATOES (17%), ORGANIC SPINACH (8%), ORGANIC COURGETTES (7%), ORGANIC ONIONS (5%), ORGANIC MUSHROOMS (5%), ORGANIC OLIVE OIL, ORGANIC CARROTS (3%), SEA SALT, ORGANIC GARLIC, DRIED INACTIVE YEAST, SPICE, ORGANIC BLACK PEPPER. 99% OF THE AGRICULTURAL INGREDIENTS ARE PRODUCED IN ACCORDANCE WITH THE RULES OF ORGANIC PRODUCTION UNDER ORGANIC CERTIFICATION US-ORG-050. We make all of our own tofu from scratch because no one can make it better than our tofu masters, who have been traditionally trained. We start with American-grown, non-GMO organic soybeans. Each batch of tofu is hand-crafted to achieve the ideal firmness. Then we chop it, dice it or marinate it, depending on which recipe we’re making. 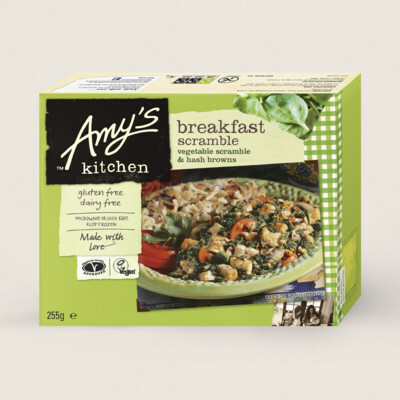 © 2019 Amy's Kitchen UK, Ltd. Website by Superrb. It looks like you're across the pond?